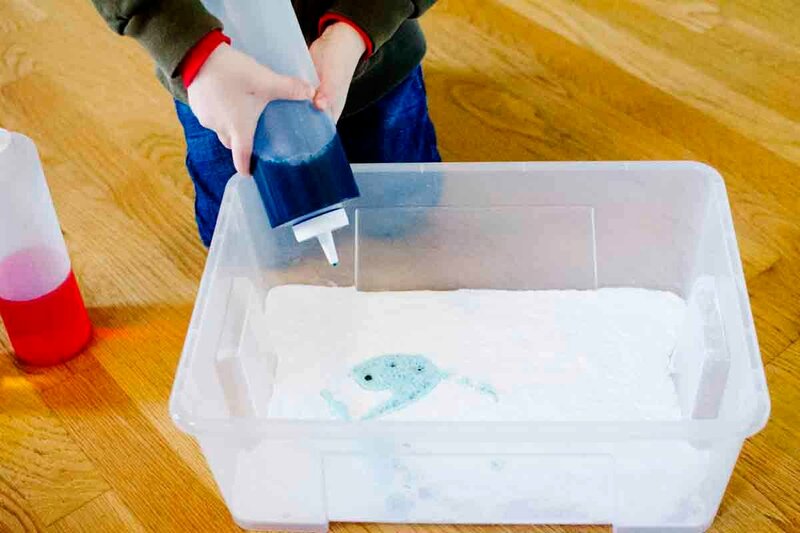 A quick and easy toddler science experiment. It felt like a “baking soda and vinegar” kind of day around here. We’ve done the whole watch it fizz experiment before and loved it, but we needed a fun, special take on the classic reaction. 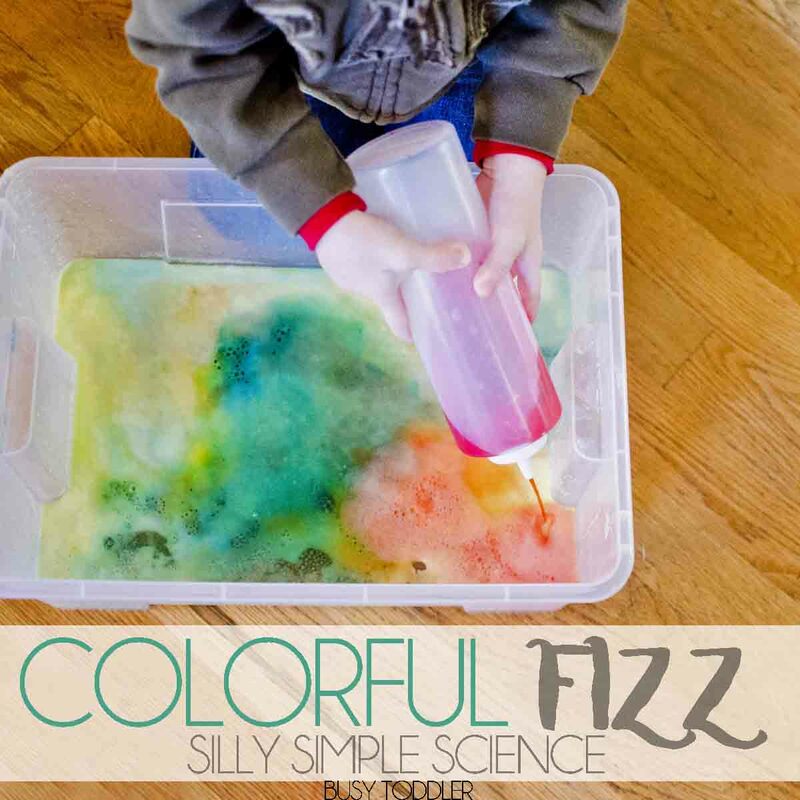 Colored vinegar to the rescue in this fun toddler science lesson! 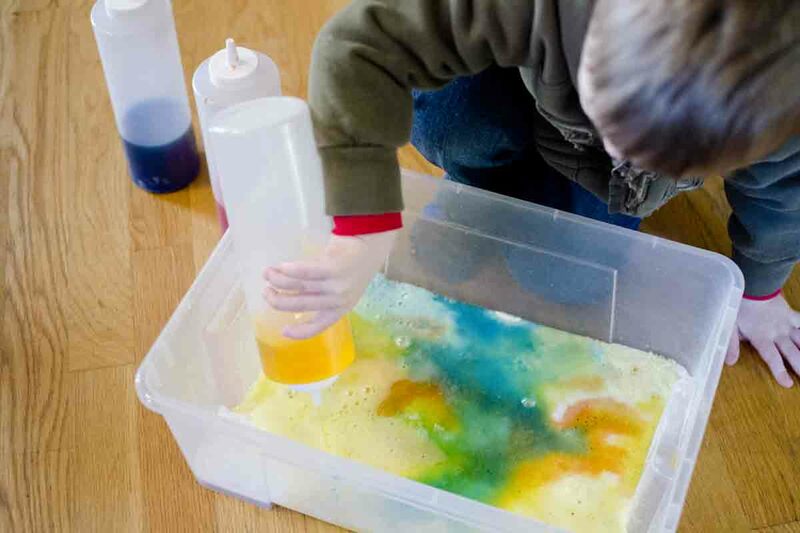 By incorporating colored vinegar into this experiment, we added an extra element of color changing fun. In addition to the hilarity of the baking soda and vinegar reaction, we also had the chance to watch the colors blend together. And it was such an easy toddler science activity to do! 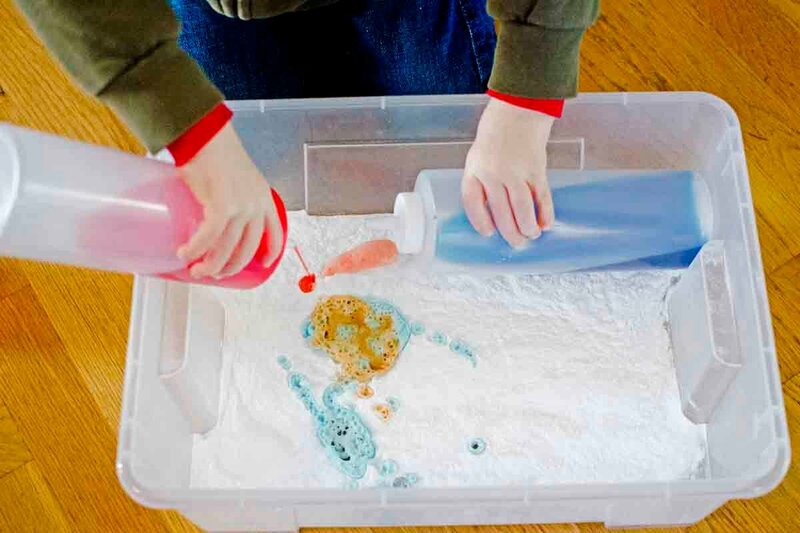 Setting up this toddler science experiment could not have been easier! I dumped about half a box of baking soda into the bottom of my tub. I made a nice layer with it and tried to keep it pretty even and smooth. I mixed a little food coloring with vinegar for each of my squirt bottles. There was method to my color choice madness: I went with just the three primary colors since they play nice together and mix well. My toddler got an absolute kick out of this on so many levels. First, there’s the excitement of the chemical reaction. It’s the coolest! 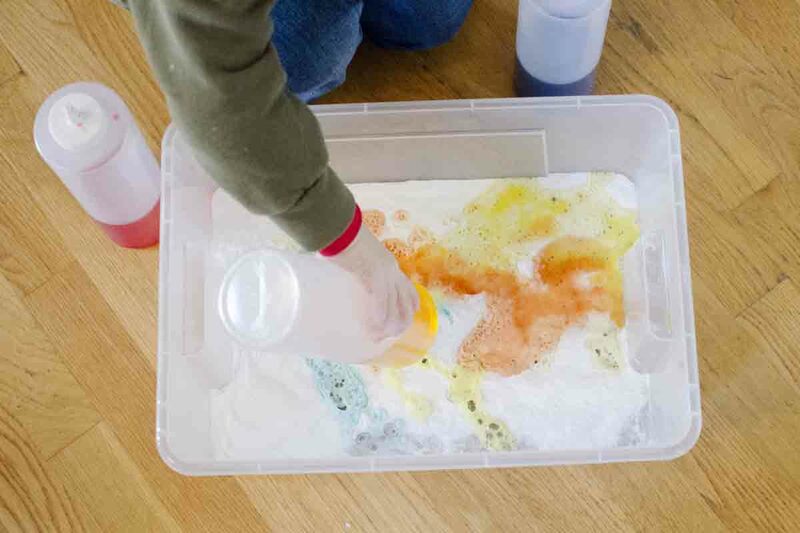 Then, the fun of seeing the colored vinegar squirting onto the white baking soda. He was a ball of giggles throughout this project. He figured out the color mixing possibilities right away and I loved this two handed squeeze/pour. Look at that grip strength! 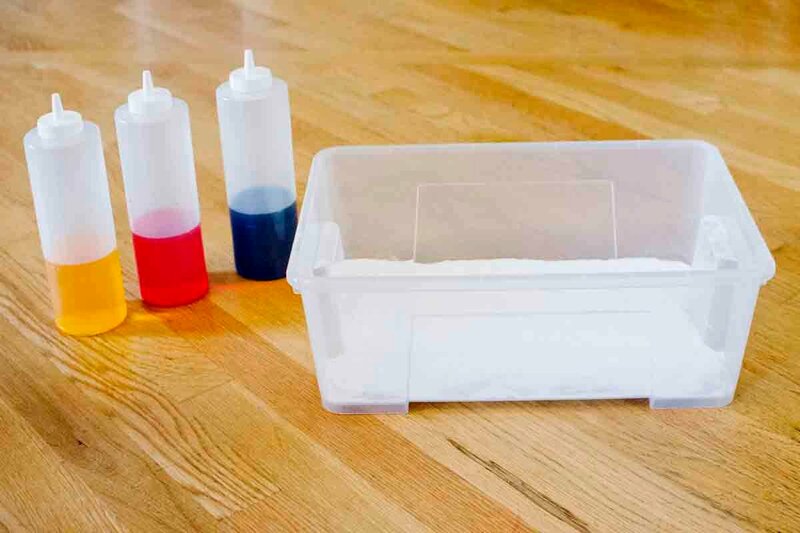 Turns out this simple science project was also a fine motor skills activity in disguise. The pressure to squeeze the bottles and the arm strength to hold them up were great bonuses to this fun. The coolest part about this activity was that once the fizzing was gone and the bubbles had died and there was no more baking soda to be seen….well… actually, there was. I just carefully carried the tub to the sink, gently dumped out the liquid, and the party restarted with the next layer of baking soda. We restarted this activity 4 times over almost 30 minutes! True story – I can show you the time stamp on my camera (wink). It really was a beautifully fun toddler science experiment and one that I know we will try again soon. It was too much fun (and too pretty to look at) not to play another round. Need a few more simple science activities? Try Disappearing Rainbow Colours, Wave in a Bottle, and Strawberry Investigation. 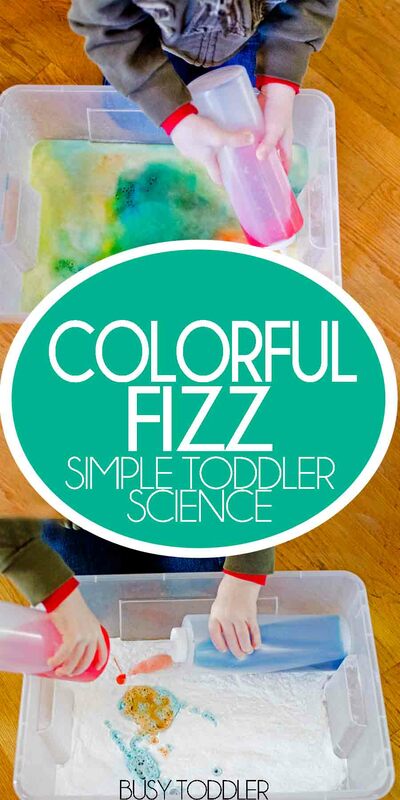 Think your little ones would like this simple toddler science activity? I love this! It looks like such a fun and simple activity! And the ingredients are so cheap, too! !